A few weeks ago our local chapter put a call out for baby quilts the same day I bought a half yard of the most darling print from Michael Miller’s “Wee Wanders” range. Using this print as inspiration, I pulled some supporting fabrics in blue, green and aqua, cut some 5 inch squares and went to work. I of course thru in some of my trusty favorites – can you spot the Mirrorball and the Pearl Bracelets? 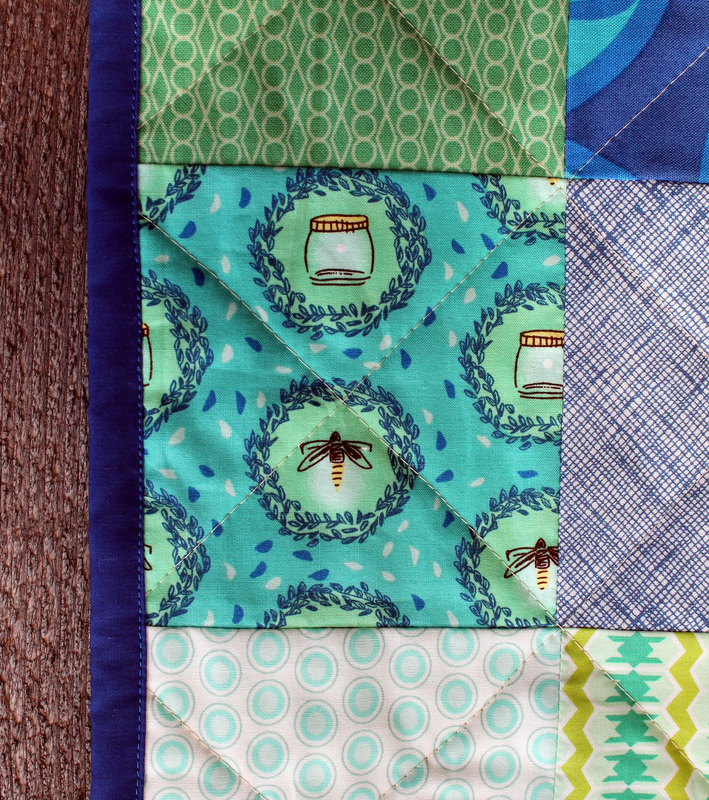 I went with simple straight line quilting in a diagonal grid. Nothing fancy but I like the detail it brings to the simple squares. 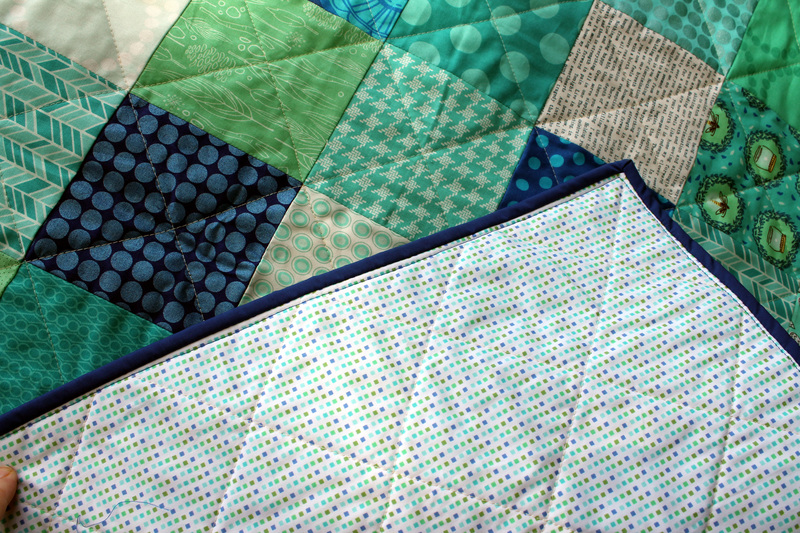 The backing is a single piece of fabric from my stash… that is one of the joys of a baby quilt, you can usually just pull a yard or so from your stash and you are good – no extra piecing needed. The final touch was simple electric blue binding. The quilt was delivered yesterday to Project Linus for processing. It will then be sent out into the world to do some good. The Wee Wander line is great; those lightning bugs are just so fun! I agree with you that baby quilts are really satisfying to make, and I especially like how easy they are to get backing fabric for! 🙂 I am impressed with all your generosity. 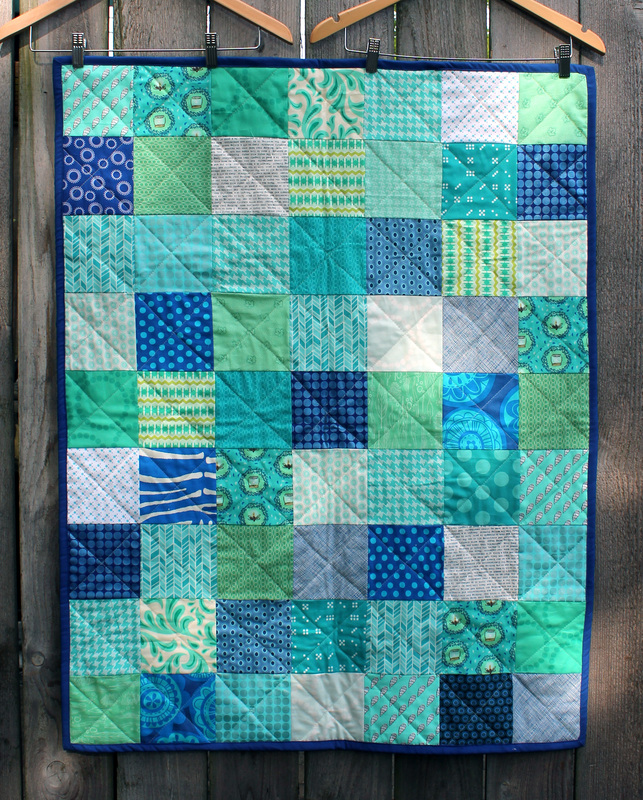 Someone is really going to love this quilt! It’s gorgeous and bound to bring smiles where ever it lands! You have such a wonderful heart. 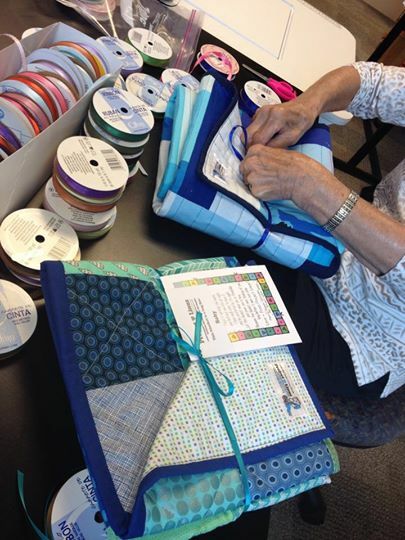 As a former foster parent, who has had children be recipients of Project Linus quilts, I can tell you how big of a gift you are giving these children. It makes their faces light up with happiness and wonderment. They have never gotten something so special before. Thank you so much for leaving this comment. I constantly send out blankets but never know where they end up or if they are bringing comfort. I hope that is the case and it is nice to know they are valued. I have made quite a bit in this colour scheme in the last couple of weeks. I am really loving it too. I love this blue and aqua colour scheme. Yes, there they are, mirror ball and pearl bracelet up the left hand side. And that simple cross hatching is my favourite kind of quilting – holds the layers together, and doesn’t distract from the design or colour. Lovely job, as always! Love the quilt! The colours are fabulous, the blue binding really makes the colours sing. Congratulations on a finish! Looks like you do good in more than one way! 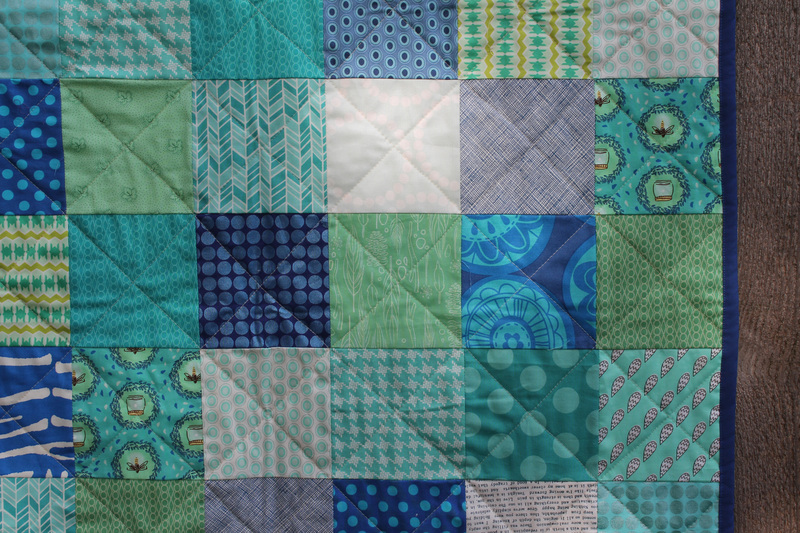 I just love all of the quilts you make for project Linus. Know that whoever receives them will truly treasure them- they are so beautiful. These colors are so great. There’s a child out there that is going to feel so blessed to have this! This color scheme is great! The simple quilts are always my favorite. Your quilting is buuftiael! I love how everyone’s swirls come out a little differently, like a signature. 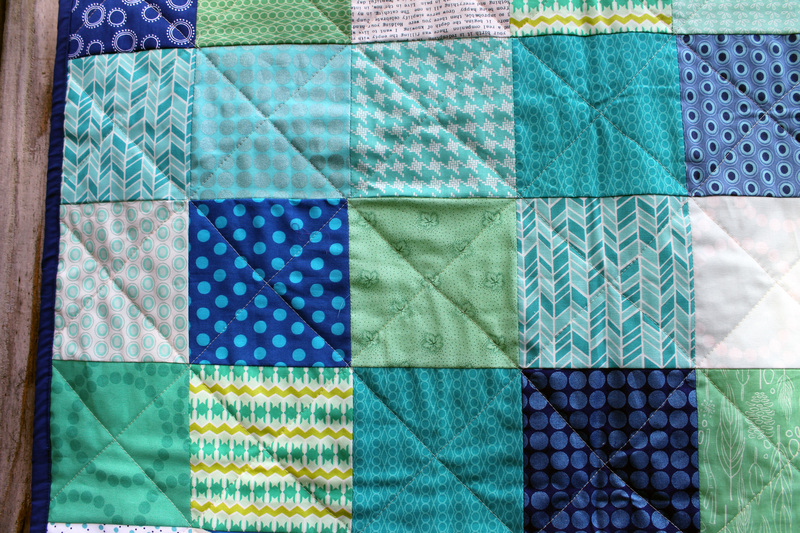 For me, the straight lines weren’t so easy to quilt — and neither were the curved ones, but that’s why I’m doing this challenge in the first place!Can I ask, what’s a “flimsy?” I’ve never heard that term before. Niven a flimsy is an Australian term for a quilt too which has not been basted or quilted. An American friend of mine recently told me about the term flimsy and I had to use it.